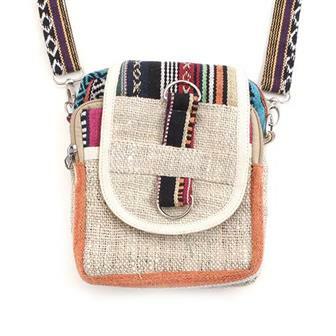 Deliciously different Fair Trade bags from around the world, with an ethnic, hippy, boho twist. Here you'll discover a wide range of great passport bags, shopping bags and exquisite embroidered items, including some beautiful recycled sari twists on conventional ideas. 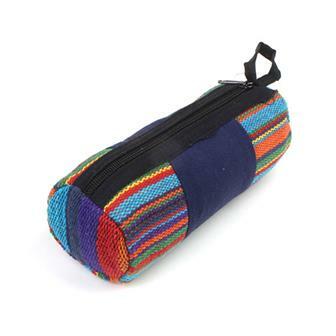 These great handmade pencil cases are perfect for injecting some colour into the office or school. 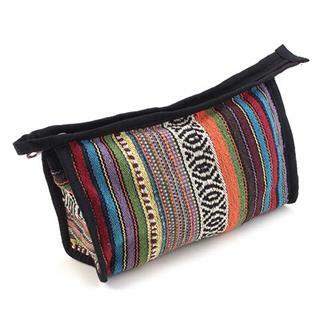 Made using Hmong hill tribe material from Northern Thailand. 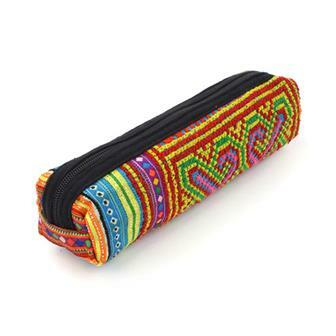 These beautiful, unique pencil cases are sure to liven up your desk at school or work. 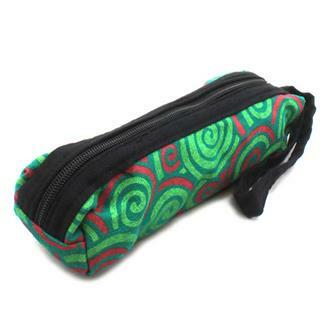 Available in a wide spectrum of mixed spirally colours, these funky pencil cases will bring plenty of lively colour to your desk at school or work. 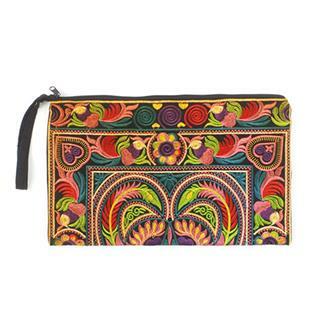 These large purses feature a fantastic arrangement of vibrant embroidery in a floral and bird pattern. Handmade in Thailand. 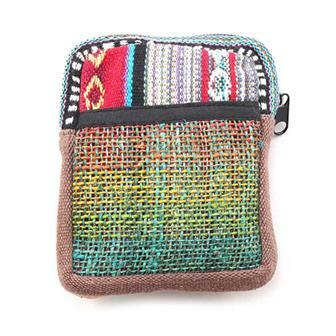 These eye catching, medium sized bags are made from our wonderful Thai weave style cotton. 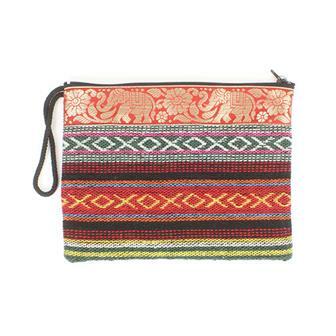 Each bag is hand made in Thailand and is decorated with a length of golden thread elephant trim fabric. The zip up top and handy size makes these bags a useful travelling accesory! These useful little heavy cotton bags are made from traditional gheri weave and are perfect for keeping all your important documents and small items together whilst travelling. With a single zipped compartment, these bags are uncomplicated little organisers! These useful little cotton bags feature Om symbol block prints and are perfect for keeping all your important documents and small items together whilst travelling. With a single zipped compartment, these bags are uncomplicated little organisers! 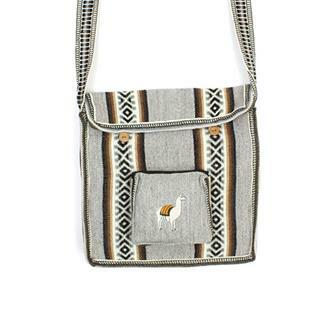 Slim profile fabric satchel a wonderful soft weave adorned with traditional patterning and embroidered with a majestic llama. Features a large fastened compartment and a zipped front pocket. Sweet, fold out shopping bag made from pieces of beautiful old sari material. each bag is unique due to the recycled nature of the material. 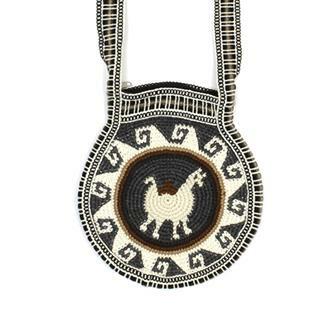 Stitched with a sturdy zip and finished with a large keyring hoop, great for an unexpected shopping trip. These handy little day bags are the perfect item for travelling. Made with a mix of tactile natural hemp and traditional coloured heavy cotton gheri material. Each of these explorer bags has plenty of useful compartments, both zipped and open for your valuables. 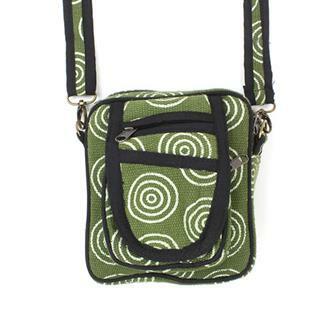 It features an adjustable shoulder strap and belt strap. Made in our popular spirally fabric, these clever utility pouches are designed to offer a large number of pockets and features in a small space. 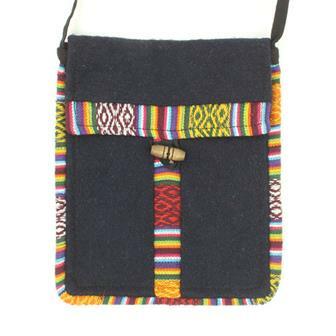 These incredibly useful little pouches are handmade in Nepal from mixed gheri patches and have a loop on the reverse for attaching to a belt or large rucksack. 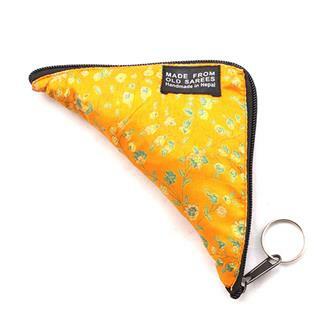 Great for keeping items close to hand when out and about. These ingenious Nepalese made bags are designed to unzip and unfold from a small square drawstring ditty bag into a larger shopper bag with an external pocket. The bags are decorated beautifully with the wonderfully bright and eye catching traditional Tibetan material and come in a variety of fine colours. 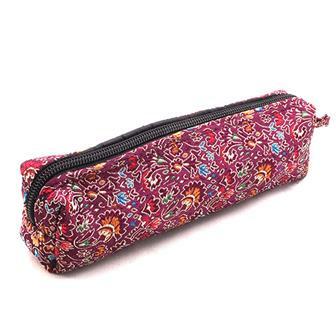 These pencil cases are made from a wonderfully detailed brocade material. Perfect for brightening up your desk! 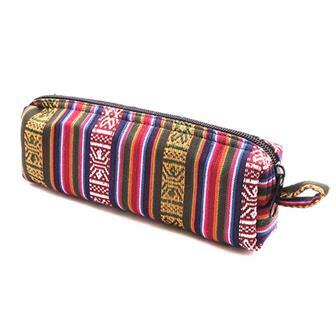 These pencil cases are made from a traditional Tibetan pattern material. Great for splashing a little extra colour around your stationery! 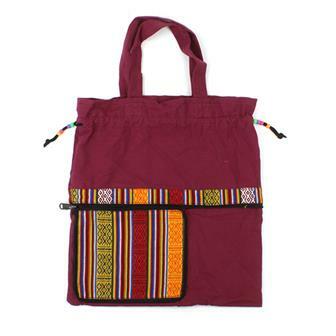 Heavy cotton bag with wooden toggle and long strap with traditional Tibetan material trim. Attractive little velvet bag with long strap and two zip compartments. 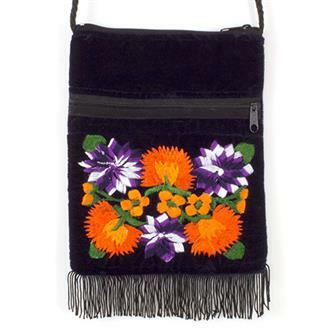 Each bag is heavily embroidered with floral designs. 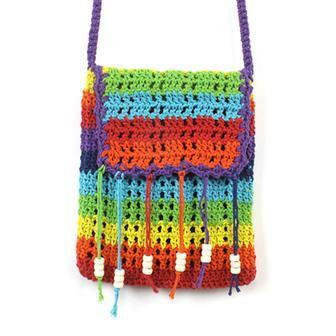 Chunky cotton crochet bag in vibrant rainbow colours with tassels and bead work, lined with cotton and fitted with zip. 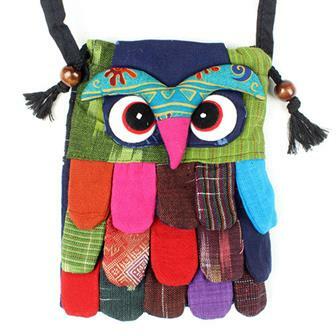 Brill little owl bag, made from a wonderful mix of fabric offcuts to always create unique items. The bag has a long strap to wear around the neck or over the shoulder, a main drawstring compartment closed by pulling the bead 'ears' and a separate zipped compartment on the back for your valuables.